Colonel Paul Tibbets describes dropping the A-Bomb on Hiroshima August 6, 1945. In the early morning darkness of August 6, 1945 the B-29 "Enola Gay" piloted by Colonel Paul Tibbets lifted off the runway at Tinian Island and flew into history. Approximately four hours into the flight, Col. Tibbets announced to his specially trained crew that they carried the world's first atomic bomb and that their target was Hiroshima. Their objective was a city of approximately 350,000 located on the southwestern portion of Japan's largest island and as yet untouched by the massive bombing raids carried on by US forces. The remainder of the trip to their target was unmarred by any Japanese opposition as the bomb was armed and prepared for release. 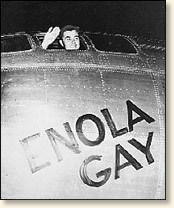 The Enola Gay arrived over the city at 7:25 a.m. cruising at an altitude of 26,000 feet. At 8:16 the bomb was released and detonated a few thousand feet above ground. A blast of blinding light engulfed the crew as the plane made a radical turn to escape the explosion. Donning their protective goggles, Col. Tibbets and his crew looked back to behold an ominous mushroom-shaped cloud boiling into the upper atmosphere. The city was destroyed. After the war, Supreme Allied Headquarters estimated that 129,558 were killed, wounded or missing as a result of the blast. Yet, this was not enough to persuade the Japanese leadership to surrender. Even a second atomic attack three days later on the city of Nagasaki failed to bring an immediate end to the hostilities. It was not until August 14 that Japan agreed to an unconditional surrender. Read an eyewitness account from a Japanese survivor.